You can become a FEMA Disaster Action Kid and get a certificate! Being a Disaster Action Kid is Fun! Disaster Action Kids are prepared! They know what items are needed in a disaster supply kit. They know how to protect their pets during a disaster. They also know what to do during each type of disaster. Being a Disaster Action Kid isn’t easy, but it’s worth it! Get your friends involved, too. All you need to do is read about disasters on this site, do the activities and test your knowledge. When your checklist is complete, fill in this form to get a certificate with your name on it. Then just print it out! 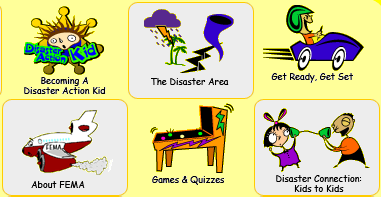 You can also get posters, videos and other fun things for free if you are a Disaster Action Kid. 9-1984 FEMA 475 Preparing for Disaster. 5-0200 Door Knob Hanger: Fire Safety. You can order FREE items from the U.S. Geological Survey. Booklet: Owlie Skywarn - Watch Out Storms Ahead! below and ask for NOAA/PA 200451.
and ask for NOAA/PA 96071. Create a separate free email account to use for your freebies - so your personal email doesn't get filled with junk emails.